Junior goaltender Matt McNeely stopped all 23 shots he faced and Minnesota Duluth got goals from three different players on the way to a 3-0 win over the University of Notre Dame in the third-place game of the Ice Breaker Tournament held at the Compton Family Ice Arena. In the title game, the University of Minnesota won the tournament by an identical 3-0 score over Rensselaer to win its second consecutive Ice Breaker championship. Sophomore forward Hudson Fasching was selected as the tournament's most valuable player. Center Dominic Toninato paced the Bulldogs' attack with a goal and an assist and was selected to the all-tournament team after scoring three goals with an assist on the weekend. Alex Iafallo and Tony Cameranesi also scored for Minnesota Duluth. Freshman goaltender Cal Petersen took the loss in goal, making 26 saves in his first official collegiate action. Two of the three goals Petersen surrendered came on the power play. Minnesota Duluth out shot Notre Dame by a 29-23 margin in the contest. The loss drops the Irish to 0-2-0 on the season while the Bulldogs are now 1-1-0. The 0-2-0 start for Notre Dame is the first since Jeff Jackson's first year with the Irish in 2005-06. "Anytime that you lose two games at home is not good," said Irish head coach Jeff Jackson. "I'm going to be patient. I have to be. We have some good, young player, more true freshmen than we've ever had since I've been here and that youth shows up in certain areas of the game. It's the veterans that have to lead the way. Some of the mistakes they are making; they are just trying too hard. They have to play the game simple and play the way we are capable of." Minnesota Duluth was two for eight on the power play and scored on its first chance with the man advantage just 7:40 into the first period as Cameranesi scored his first of the season, banging a rebound past Petersen to give the Bulldogs the 1-0 lead. Defenseman Carson Soucy fired a shot from the right point that was deflected by Toninato in the slot. Petersen made the stop, but Cameranesi was there to put the rebound home. The Bulldogs struck twice in the second period with the second goal coming via the power play as the Irish got caught up and Iafallo beat the defense to snap a shot past Petersen. The Irish had broken up a Duluth rush and dumped the puck into the Bulldogs zone. McNeely quickly moved it up ice to defenseman Andy Welinski who put Iafallo in behind the defense on the way to a 2-0 lead at 6:52 of the middle stanza. "Obviously the penalties and the turnovers hurt us," said Jackson. "Two or three of the penalties were the direct result of turnovers. We kept shooting ourselves in the foot. We took one offensive zone penalty and two power-play penalties. You aren't going to win doing that." Toninato closed out the scoring at 19:24 when he scored his third goal of the season off assists from Adam Krause and Iafallo for his third of the season and the 3-0 lead. From there, McNeely and the Duluth defense did the job, holding the Irish off the scoreboard the rest of the way. The home shutout was the first against the Irish since Jan. 24, 2014 when Northeastern's Clay Witt blanked the Irish 4-0. Notre Dame was zero for six on the power play, including a pair of five-on-threes. 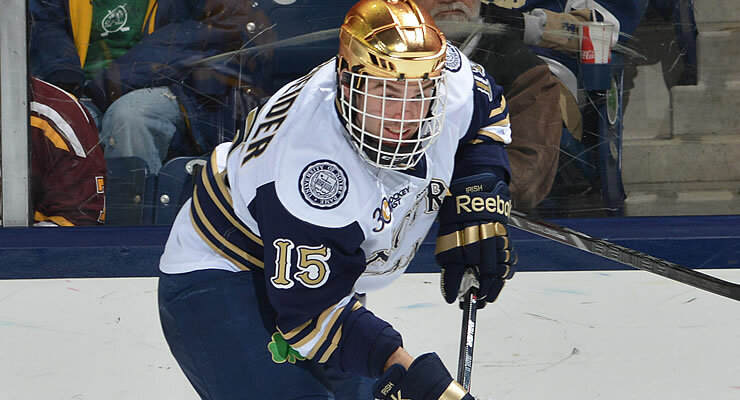 The Irish will look to find the winning recipe next weekend when Notre Dame plays host to Lake Superior State at the Compton Family Ice Arena on Oct. 17-18. Friday's game has a 7:30 p.m., start time while Saturday's contest will drop the puck at 6:05 p.m. In the championship game, Minnesota goaltender Adam Wilcox stopped all 22 shots he faced to blank the Rensselaer Engineers 3-0. The Gophers' Connor Reilly had a goal and an assist while Seth Ambroz and Fasching scored one goal each. Minnesota, the top-ranked team in the nation, is 2-0-0 on the year while RPI is 1-1-0. Toninato and Rau led the tournament in scoring with four points each. Toninato had three goals and one assist while Rau had a goal and three assists. Fasching had two goals and one assist on the weekend.